These two lesson plans are designed to teach students everything they’ll need to know to observe plant phenology and record data for the USA National Phenology Network. 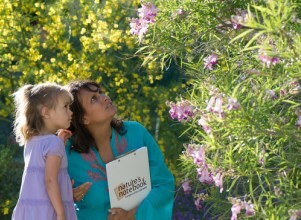 Written for phenology gardens, these activities can be conducted in any outdoor setting. Created by Susan Mazer, Alisa Hove, and Brian Haggerty at the University of California, Santa Barbara as part of the Phenological Literacy: Understanding Through Science and Stewardship Program (PLUSS). This fun activity gets students working together and running while reinforcing their knowledge of plant phenology and monitoring protocols for the USA National Phenology Network. Created by Susan Mazer, Alisa Hove, and Brian Haggerty at the University of California, Santa Barbara as part of the Phenological Literacy: Understanding Through Science and Stewardship Program (PLUSS). Experience the importance of plant phenology from a pollinator’s perspective! Adaptable for other perspectives too (herbivores, frugivores, granivores, plant pathogens). Created by Susan Mazer, Alisa Hove, and Brian Haggerty at the University of California, Santa Barbara as part of the Phenological Literacy: Understanding Through Science and Stewardship Program (PLUSS). A guide to phenological monitoring for students, teachers, families, and nature enthusiasts. Created by Susan Mazer, Alisa Hove, and Brian Haggerty at the University of California, Santa Barbara as part of the Phenological Literacy: Understanding Through Science and Stewardship Program (PLUSS).